Pirates of the Caribbean - The Mickey Wiki: Your Walt Disney World Encyclopedia! 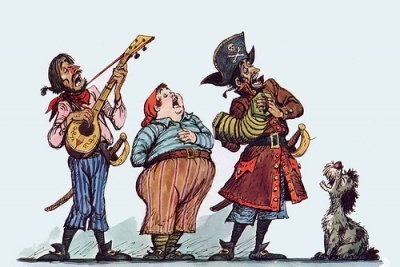 Marc Davis concept art for Pirates of the Caribbean. The concept for what would eventually become Pirates of the Caribbean began in the late 1950s, as an idea for Disneyland. Walt Disney himself began to toss around the idea of a pirate attraction for the planned New Orleans Square area, and he tasked Marc Davis with creating concepts for the attraction . Initially, Disney had planned on the pirate attraction being a walkthrough wax museum , which showcased various pirates from throughout history. Blackbeard, Captain Morgan and Captain Kidd were all to be included in the new museum . As development on the attraction continued however, the idea of focusing on real life pirates was discarded. Instead, the attraction took its cue from pirates that were designed by Marc Davis. These characters were more “cartoony” then the historical pirates that were initially planned on . During the development of Pirates of the Caribbean, Disney decided to completely change the format of the attraction. Following the success of it’s a small world at the 1964 World’s Fair, the pirate attraction was reimagined as a boat ride. The driving force behind the change was capacity. By changing the ride format, Pirates of the Caribbean would be able to hold 3,000 people (the capacity of it’s a small world) as opposed to the 500 people that wax museum could have held . Furthermore, by making the attraction a boat ride, Disney would be able in ensure that guests were experiencing the scenes in the same way, at the same time . As for Pirates of the Caribbean’s storyline, Claude Coats and Marc Davis worked together to create most of the characters and scenes. Walt then brought X Atencio in to write a narration, as well as the attraction's theme song ""Yo Ho (A Pirate's Life for Me" (with George Bruns) . Furthermore, Bob Gurr was called upon to create the attraction's ride vehicles (as well as work on other technical aspects of the attraction) and Yale Gracey (along with Claude Coats) created many of the special effects used within the ride . Also of note, is the fact that Blaine Gibson sculpted the characters in the attraction, which were then clothed by Alice Davis. Pirates of the Caribbean opened on March 18 1967, and quickly became one of the most popular attractions in the park. 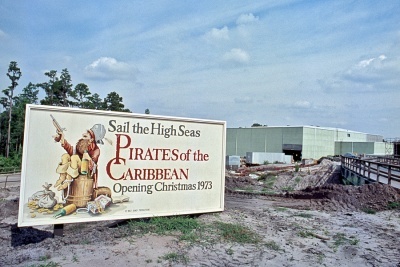 The future sight of Pirates of the Caribbean prior to its 1973 opening. When Walt Disney World’s Adventureland opened on October 1 1971, there was no Pirates of the Caribbean attraction to be found. Instead, Disney had planned on building the Western River Expedition in Frontierland. Designed by Marc Davis, the Western River Expedition would have featured a boat ride (using the same ride design as Pirates) that would have taken guests through scenes in the Old West . Disney initially planned on creating the Western River Expedition as opposed to Pirates of the Caribbean, because they believed that people on the East Coast would not be as interested in the subject (due to the fact that pirates were a part of Florida’s history and thus part of the local lore) . When the Magic Kingdom opened however, one of the most frequent questions that guests asked was “where are the pirates?” Heavily promoted on the Disneyland TV series, Disney quickly realized that there was a high demand for an East Coast version of Pirates of the Caribbean . Due to this demand, Disney quickly authorized the construction of Pirates of the Caribbean Ride inside the Magic Kingdom. To do this, Disney scrapped its plans for the Western River Expedition and instead focused its resources on Pirates . In order to incorporate Pirates of the Caribbean, Walt Disney World's Adventureland was expanded. The area Disney created, called Caribbean Plaza, extended Adventureland so that it now touched Frontierland on its western border . Pirates of the Caribbean opened in Adventureland on December 15, 1973. No real changes came to Pirates of the Caribbean until 1997 when the scene that showed the pirates chasing the women of Port Royale was altered. Following the refurbishment, instead of the pirates chasing the women for nefarious reasons the scene now showed the women chasing away the pirates . The other change that came in 1997 was to the “Pooped Pirate”. The “Pooped Pirate” is a pirate located near the women who are chasing the pirates. Originally he told his dog how he was too tired to continue to chase the women, while a blonde woman hid in a barrel behind him. In 1997 his dialogue was changed so that he now told his dog about his treasure map ("This map says X marks the spot, but I be seein' no X's afore me”) . Furthermore, the woman in the barrel behind him was given a small treasure chest, apparently trying to keep it safe. Captain Jack Sparrow was added to Pirates of the Caribbean in 2006. The outside of the fort that houses Pirates of the Caribbean was slightly altered. New props and a new "black sail" entrance sign were added to the attraction. The Pirate Barker Bird that had previously talked to guests outside of the entrance was also removed . The talking skull with crossed swords that warned guests about the attraction's drop was removed . In the pirate ship battle scene, Barbossa now captains the Wicked Wench. The pirate captain declares that he is trying to find Jack Sparrow . The cannons in the battle were also altered so that they fired smoke and compressed air . In the subsequent room, when the pirate captain is shown dunking the mayor, he now demanded to know Jack Sparrow's whereabouts . Jacks Sparrow was now seen nearby, hiding in a dress shop façade . The Pooped Pirate was given a key and a treasure map. In the barrel behind him, Jack Sparrow could now be seeing eyeing both items . 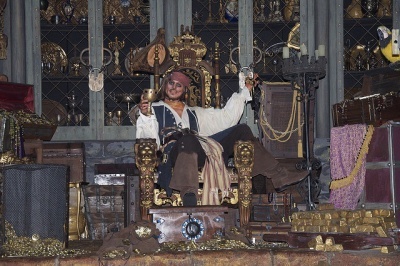 The treasure room was completely redone, so that Jack Sparrow now sat on a throne, atop his treasure . 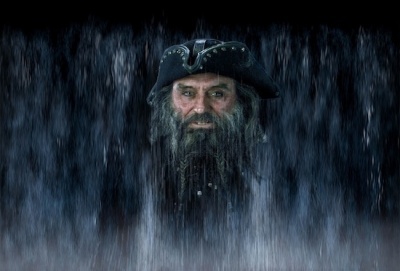 To coincide with the release of Pirates of the Caribbean: On Stranger Tides, Blackbeard (the main antagonist in the film) replaced the Davy Jones projection on the waterfall on May 20, 2011 . On September 19, 2012, in conjunction with International Talk like a Pirate Day, Disney announced that they would be adding another tie-in to On Stranger Tides to the attraction. On October 19, ghostly mermaids were added just after guests go under the waterfall. As the boats float by, the mermaids can be seen in the water as Jolly Sailor Bold plays in the background. On the nearby beach scene, a mermaid skeleton was also added at this time . In 2015 Pirates of the Caribbean was closed for a major refurbishment. During this time, the attraction was cleaned, repaired and relighted. Other changes that occurred during the refurbishment included the addition of Davy Jones back onto the attraction's waterfall (he now rotates with Blackbeard) and the Audio Animatronics including Barbarossa, Jack Sparrow and the Redhead, were given new costumes . At this time a few new effects were added to the attraction including: new cannon effects, new lightning effects, the "drunk pirates" whiskey now being on fire, and new smells added throughout the attraction . Backstage, the attraction's ride system was also updated during the refurbishment. On June 19, 2017, the talking skull and crossbones was re-added to the attraction just before guests go down the ride's drop. The addition was a part of the integration of Disney's Photopass, with guest's on-ride picture now being taken . On June 31, 2017, Disney announced that Pirates of the Caribbean's auction scene would be changing. According to the concept art, the Redhead character will become a pirate, who leads in the auctioning off of the townspeople's valuables . On February 26, 2018, Pirates of the Caribbean closed so that the new Redhead scene could be added to the ride. On March 19, 2018, Pirates of the Caribbean reopened . The refurbished attraction now features a new auction scene which includes a female pirate named Redd, who oversees the auctioning of the townspeople's plundered goods (along with the auctioneer). Blackbeard as he appears on the waterfall. In order to board Pirates of the Caribbean, guests wind their way through a Spanish fort. After reaching the loading area, guests board their boat and begin to sail into darkness. As the boat floats forward, guests are given two different warnings. First, that “there be rough waters ahead” and secondly, (and famously) that “dead man tell no tales”. After hearing the second warning, guests approach a waterfall which depicts Blackbeard (or Davy Jones) who answers the second warning by saying, “But they do. So says I, Blackbeard!”. After passing under the waterfall (which is actually just mist), guests find themselves in the middle of a hurricane. In the water next to the boat, guests can see mermaids menacingly swimming by, as “Jolly Sailor Bold” plays in the background. With the wind howling around them, guests then pass by a beach that holds a mermaid skeleton, as well as pirate skeletons which lay next to a dug up treasure chest. Based on their skeletons, it appears that pirates were killed while searching for treasure. On the other side of the water guests pass a skeleton pirate steering a pirate ship. With “dead man tell no tales” still echoing in the background, the boats then plunge down a small drop, before entering the next scene. As guests enter the next room they quickly find themselves in the middle of a pirate ship battle. On the left side Captain Barbossa steers his ship the “Wicked Wench”, as his crew fires cannons over guests’ boat, at an opposing ship. While he gives the orders to attack, Barbossa yells at the opposing crew, demanding to know where Jack Sparrow is. After surviving the pirate battle, the riders sail into Port Royale. The port is under attack by pirates who have taken the citizens hostage as they plunder the town. On guest’s right, pirates dunk the mayor of the town in a well, trying to obtain whereabouts of Captain Jack Sparrow. A large women yells to the mayor (who's name is Carlos) “Don't be a chicken”, and they mayor seemingly gives up no information. In an ironic twist, Jack Sparrow is actually hiding behind a group of mannequins, right behind the pirates. As the boat continues to sail through town, on the left hand side guests see a sign for an auction. Here, the auctioneer and a female pirate named Redd are auctioning off the townspeople's plundered goods. Although the auctioneer tries to sell hens and other good, it becomes evident that the pirates really just want the rum. Continuing forward (under an overpass) the boats then enter a new scene, although it is still located in Port Royale. The pirates are all now drinking heavily and enjoying their plunder, as an instrumental version of Yo Ho (A Pirates Life for Me) plays in the background. As the boat continues on, guests see that the women of the town are now fighting back and chasing the pirates. Below, the “Pooped Pirate” tells his dog that he has both a key and the treasure map. He also says he'd love to see the look on Jack Sparrows face. Unknown to the pirate, Jack Sparrow is actually in a barrel behind the buccaneer, with his eye on both the map and the key. As the boat enters the next scene, they pass by a particularly dirty pirate who is drinking next to various livestock. As guests enter the next scene, they immediately see that Port Royale is now on fire. A pirate band (clearly heavily intoxicated) sings Yo Ho (A Pirates Life for Me), as the town burns around them. Further ahead, all throughout the town the pirates continue to drink and sing in celebration. On the right, one pirate is so intoxicated that he is lying in the mud with the pigs (apparently having fun). As guests pass under a bridge, a pirate's harry leg hangs down above them as they continue onto the next scene. 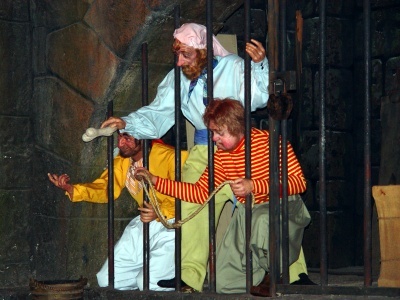 The next scene in the attraction shows that the pirates have been captured. On the right, jailed pirates plead with a guard dog to give them the key. The pirates try to use bones and other items to lure the dog over, but with no luck. After exiting Port Royale, guests enter the final scene in the attraction which shows Captain Jack Sparrow sitting in a treasure room. It seems that the captain has found the treasure that all of the pirates had been looking for, as he is seated on a throne surrounded by booty. While guests past the room Jack Sparrow sings part of “Yo Ho (A Pirates Life For Me) and makes many small comments about his treasure. The boat then arrives at the unloading dock, and exit the attraction into a gift shop. In the queue line, the position of the chess pieces that the skeletons are playing with is not random. Imagineer Marc Davis specifically set up the board so that every move would result in a stalemate. Due to the pieces being moved however, they may not currently be in their proper places . The Pirate Barker Bird previously located outside of Pirates of the Caribbean was located at the World of Disney Store in Downtown Disney from 2007 until 2009 . From 1973-1980 there was a Pirates of the Caribbean arcade located in Caribbean Plaza . The "waterfall" that guests drop down is 14ft high . The popular Pirates of the Caribbean film series was based off the Pirates of the Caribbean attraction. Pirates of the Caribbean was the last Disneyland attraction created that Walt Disney himself personally supervised . Marc Davis' coat of arms can be found in the treasure room in Pirates of the Caribbean . This page was last modified on 19 March 2018, at 19:17.